A revolution may begin with just one man, but it cannot continue at that pace forever, and Canadian filmmaker, Rob Stewart, proves this point when I meet with him to discuss his second film, REVOLUTION, in Toronto, just before it opens across Canada. Before our interview can even begin, he needs to get some tea with honey to fight off the cold he can feel coming on and though he never claimed to be leading the fight to save the planet, it’s pretty clear that he cannot do it alone. 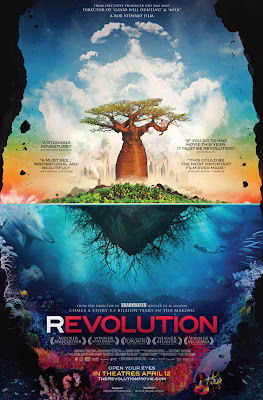 REVOLUTION is Stewart’s follow-up to his revelatory debut, SHARKWATER. The latter played to great fanfare in film festivals around the world and went on to have a successful theatrical run as well. In it, Stewart alerted the world to the atrocities sharks were suffering so that man could enjoy a simple soup made from their fins. More importantly though, he showed us how the extinction of sharks, a species that has survived all five mass extinctions on this planet, could usher in our own demise. Little did he know at the time though, saving sharks was just the beginning, and that a revolution would soon be coming. REVOLUTION picks up where SHARKWATER left off. Sure we could save the sharks but what would be the point if all the fish on the planet are expected to be gone by 2048 anyway? And what about the depletion of the coral reefs or ocean acidification from the carbon emissions coming from the exploitation of the Alberta tar sands or the deplorable deforestation that is slowly but surely destroying our planet, our only home? When you add it all up, it is easy to see that a revolution is truly necessary if we are to actually save ourselves. “We needed to bring this story to everyone and it was a giant task to bring the most devastating story possible in some form of entertainment that wasn’t going to depress everybody and make them want to jump off a bridge. We want them to come out positive in the end,” asserts Stewart, an impressively unflinching optimist himself. The biggest obstacle facing this revolution, as Stewart sees it though, is knowledge and awareness. Felix Finkbeiner founded Plant for the Planet at just 9 years old. What can we do then, right now, to help, I ask. “Get everybody to see REVOLUTION,” Stewart answers. It may seem somewhat self-serving but Stewart doesn’t care how you see the movie, in a theatre or downloaded illegally, just so long as you do, so that your eyes can also now be open. “I think we have everything we need to turn this around and turning it around is going to be awesome,” Stewart states with full confidence. By this point, he’s even got me convinced. And so what applies to the individual, also applies to the whole. For more information on the film, please visit the REVOLUTION official website. To follow REVOLUTION on Facebook, click here. To follow REVOLUTION on Twitter, click here. Saw this great movie in the theatres. If I win, I plan on donating it to my kid’s school.